Each Family Member will Receive 1 Free Dental Cleaning per Year! 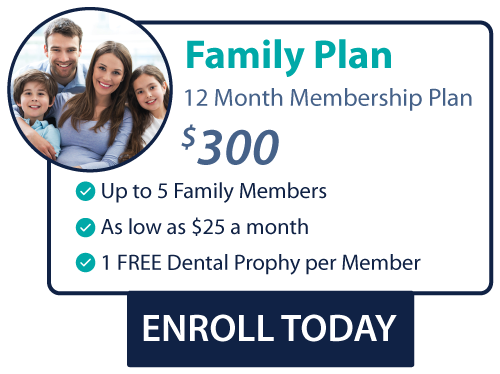 Dental Direct is proud to offer you the Family Dental Plan providing care to for up to 5 family members living in one household. We know that keeping kids safe and healthy is a parent’s number 1 concern. That’s why Dental Direct offers a discounted dental saving plan that accommodates both parents and their kids. Parents can use Dental Direct to get their kids started on an ongoing dental maintenance plan helping them to avoid various tooth related diseases and teaching them the importance of dental care at an early age. Tooth decay affects children in the United States more than any other chronic infectious disease; untreated, tooth decay can result in infections that cause pain and lead to problems associated with eating, speaking, playing, and learning. 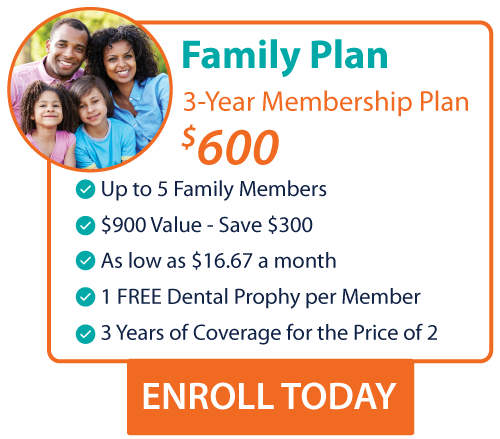 Join the Dental Direct Family Dental Plan to secure coverage for your entire family at an affordable rate and help maintain not only your health but the health of your children.